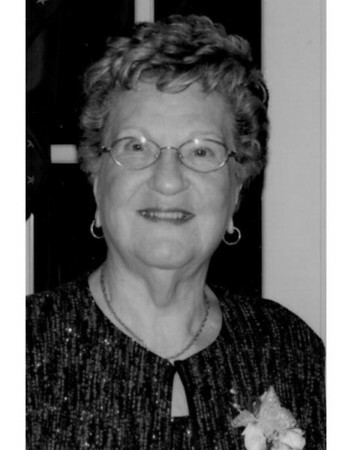 Elsie (Cubeddu) Brochu of New Britain, passed away peacefully while with loved ones, on Oct. 28, 2018, in her home, where she was born and lived her entire life. Elsie was born in 1930 to Leonard and Theresa (Lombardo) Cubeddu, who were born in, and immigrated from, Sardinia and Piedmont, Italy, respectively. She was predeceased by her husband of 42 years, Gaston (Red) Brochu, whom she met through the Miramar Restaurant, the family sandwich shop, and was married in 1950. Elsie was also predeceased by her two sisters, Mary Medon, of New Britain, with whom she shared the family home, and Lillian Ragalis of Wethersfield. Elsie was a graduate of New Britain High School, Class of 1948, where she studied with an emphasis on bookkeeping and business. She enjoyed a lengthy career using her business skills, first, for many years, with Lipman Furniture Co., and then, for many years, with the City of New Britain. Her coworkers became like family to her. After retirement, she volunteered at New Britain General Hospital, and was a member of the Rosary Guild and New Britain Council of Catholic Women at St. Joseph’s Church, a church that was very important to her. Elsie enjoyed traveling, going to many parts of the U.S. and Europe, with Italy being her favorite spot as she visited the many relatives she loved, both in Sardinia and Northern Italy. Elsie spent many years at her cottage at West Hill Lake, sharing this wonderful place with her entire extended family and many friends. Elsie’s special gifts were her warmth and her hospitality, which she extended to all of the people in her life. Elsie was the generous, loving and proud mother of three children, Michael of New Britain, Janice and husband David, of Wolfeboro, N.H., and Steven and his wife Cathy, of Middletown. She loved her many grandchildren, nieces, nephews and great-grandchildren. Over the years, Elsie spent a lot of time with her grandchildren: Carrie, Michelle, and Amy, Michael and Dennis, Stefanie and husband Patrick, and Meghan, as well as Shannon and Jessica (grandchildren by marriage). She was also proud to be a great-grandmother to Tyler, Alexa and Dominik. Throughout her life, Elsie enjoyed being part of the growing-up years of her numerous nieces and nephews. Laura, Melanie and Lisa, in particular, lived nearby, loving “Auntie Elsie” and staying especially close and helpful to her throughout her life. Funeral services will be held Tuesday, Oct 30, 2018, at 9 a.m. from the Farrell Funeral Home, 110 Franklin Sq., New Britain, with a Mass of Christian Burial at 10 a.m. at St. Joseph Church, 195 S. Main St., New Britain. Burial will follow in Rose Hill Memorial Park, 580 Elm St., Rocky Hill. Visitation will be held TODAY, Oct. 29, 2018, at the funeral home. Visitation will be today, Oct. 29, 2018, from 4 to 7 p.m. at the funeral home. Donations can be made to Divine Providence at St. Joseph’s Parish, 195 S. Main St., New Britain. To send a condolence to the family, please visit www.FarrellFuneralHome.com . Posted in New Britain Herald, on Sunday, 28 October 2018 21:02. Updated: Sunday, 28 October 2018 21:05.